Because water alone cannot completely clean a dirty part or product, an ultrasonic cleaning solution is critical for cleaning and sanitizing processes. These solutions contain ingredients that are selected based on the chemical and physical properties of the contaminants and the surface material and they are designed to optimize cavitation, the formation and collapse of bubbles. Ultrasonic cleaning solutions are either water-based or solvents that contain chemical or organic ingredients. They are mainly composed of detergents and surfactants, or wetting agents that reduce the surface tension of water. Cleaning solutions are also chosen based on their flow characteristics. Those with static fluid conditions facilitate the formation of standing wave patterns, therefore maximizing cavitation strength. Flammable solutions are avoided because of the risk of fire; the solution is heated to over 100 degrees Fahrenheit. 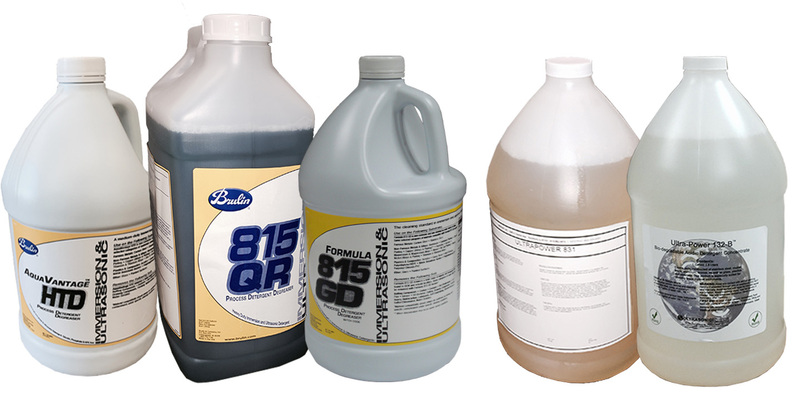 Acids and bleach are also seldom used because they damage many materials such as stainless steel and create hazardous environments for ultrasonic cleaner operators. Metals like stainless steel, iron, and magnesium need highly caustic solutions, while glass, ceramics, and plastics need moderately alkaline or neutral synthetic solutions. Ultrasonic cleaning solutions are the most important part of a cleaning system although they are one component of the larger unit. All ultrasonic cleaning equipment has, at minimum, a transducer, a generator, and an immersion tank. The parts are placed in the tank which holds the solution. These tanks vary in size and shape though generally they are rectangular and made from stainless steel or aluminum. The process begins when cavitation occurs. The transducer is either mounted to the tank or is lowered into the fluid. When the transducer introduces ultrasonic sound waves into the tank, innumerable, minute, and intense imploding bubbles release both energy and heat to provide a highly efficient method of scrubbing both exposed and concealed surfaces of the immersed parts. There is a direct correlation between the frequency and the number of implosions which allows for a high level of control; high frequencies, for example, are ideal for the removal of very small particles without harming the surface of the parts being cleaned. The level of cleaning solution must be carefully monitored. If there is a noticeable decrease in the quality of the cleaning action, the system needs to be refilled with cleaning agents. After the ultrasonic cleaning process has finished, most systems rinse the objects or parts clean of any leftover cleaning solutions. Ultrasonic Cleaning Solutions Ultrasonic cleaning solutions are used in ultrasonic cleaning equipment as an important part of the process because the solution performs the actual cleaning.